My kids like to tease me about talking “to random people about random things”. Guilty as charged! In my defense, I encounter interesting people and learn so much from these friendly encounters. Such was the case at my local Home Depot store this week. I overheard a customer asking about lemon balm and be told there was none. Lemon balm grows like a weed in my garden, the prolific offspring of a single clipping gifted to me years ago. I thought I should warn this person about the invasive nature of this herb, hence the random engaging of this young man in conversation! He explained to me that with the zika virus epidemic, he was working on a mosquito repelling garden for his pregnant wife and lemon balm was one of the plants recommended for warding off mosquitos. No better reason to create a mosquito repelling garden! I offered some of the lemon balm from my garden and we went off on another tangent on how it is also a great culinary herb (recipe here). This random conversation led me to ask myself “How hard would it be for the average home gardener to create a mosquito-repelling garden?” I am an organic gardener who does not use chemicals so I focused on a natural approach. I searched the web for many ideas and set off to create a mosquito proof garden myself in less than a day. 1- The single most important consideration in mosquito-proofing your outdoor space is to prevent mosquitos from laying eggs in the first place or having their larvae mature into adults. Eliminate all potential breeding grounds: remove any containers that hold water or turn them upside down when not in use. This includes any pots, watering cans, candle hurricanes, wheel barrows, fire pits, etc. Look at your gutters to ensure that they are not clogged and backing up with standing water. Look at the top of your A/C equipment to ensure there is no water collecting on top. If you collect rainwater in a cistern or other vessel, make sure the top is covered by fine mesh screening to prevent mosquito eggs and larvae entry. Our firepit always had standing rainwater between uses. Our solution was to drill drainage holes in the bottom. 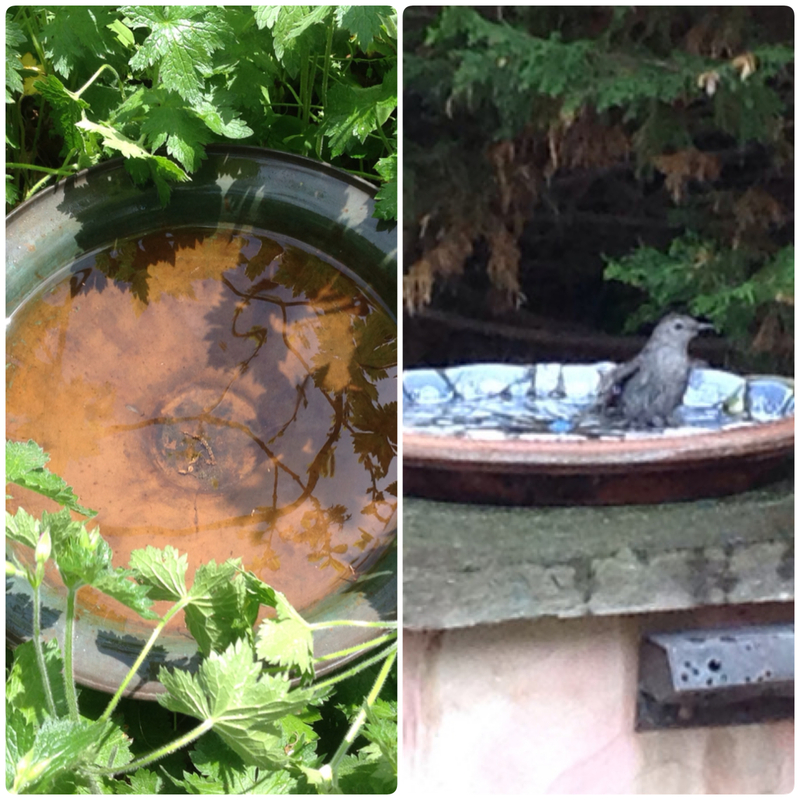 Empty birdbaths 1-2 times weekly. Instructions on making a mosaic birdbath here. Empty water bowls for pets daily. Check for leaking hoses which might allow water to pool. 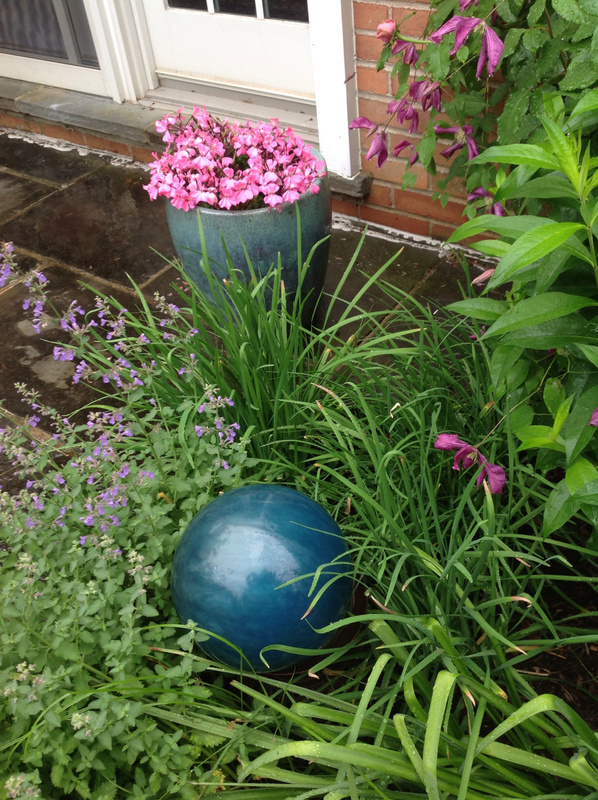 If you have open vessels as garden art, make sure the bottom has been perforated to allow for drainage. 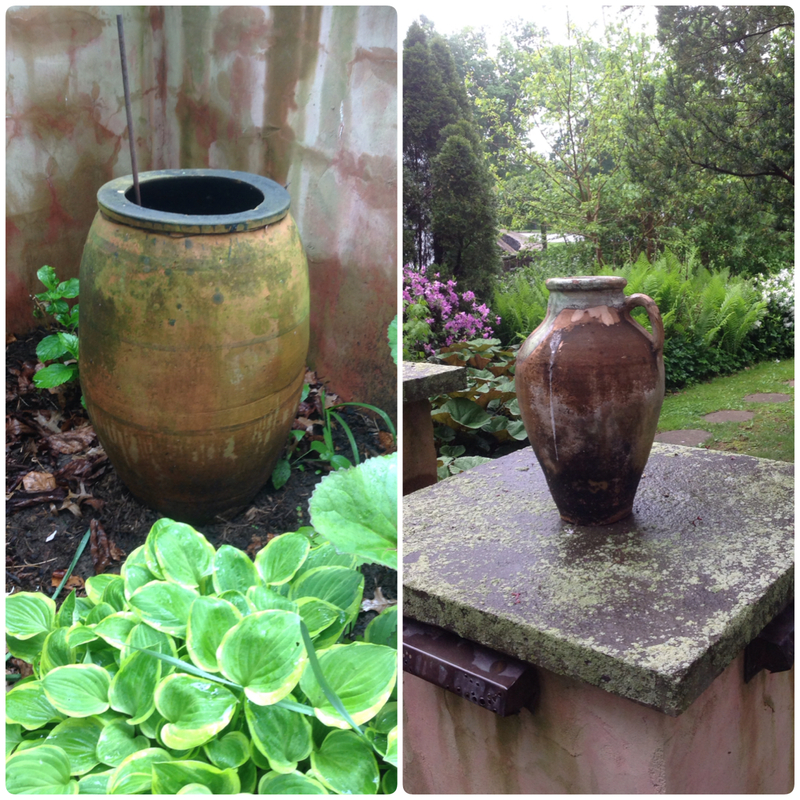 Even though these are antique olive oil containers, the bottom has been drilled to provide drainage of rainwater. The larger one on the left is sitting on bricks to keep the drainage hole open. This prevents them also from freezing and cracking during winter months, if left outdoors. Herbs are the greatest deterrent to mosquitos. Rosemary, basil, catmint, citronella plants, mints of all kinds, lemon balm, lemon grass, lemon thyme, lemon verbena are all effective as well as garlic. 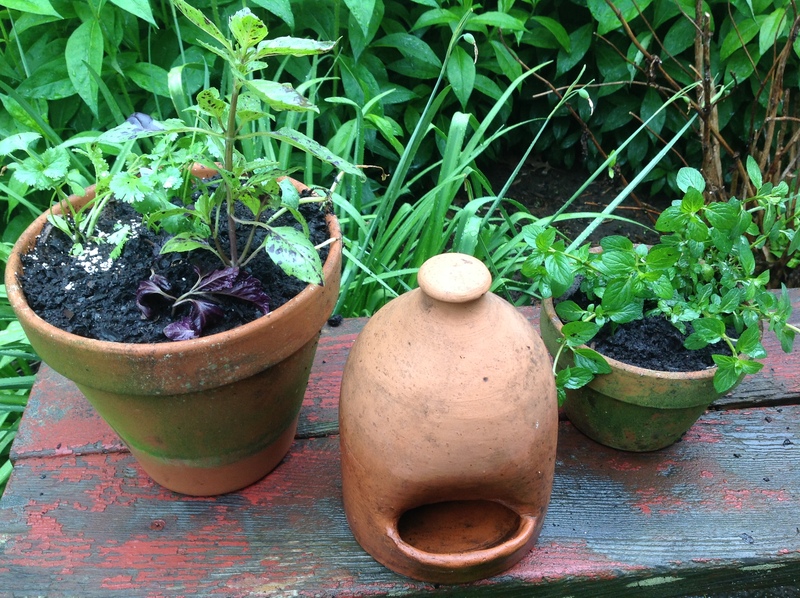 Consider keeping herbs in pots to make them portable to where people will be. Situate them near doorways. The deterrent to the mosquitos is the scent of the herbs which comes from their oils. They are most effective when the oil is released by crushing the leaves. The oil released can also be rubbed on skin as a natural mosquito repellent. Above, the lemon balm that sparked a conversation. I have it planted in a pot now to restrict its spread. On the right are some of the offspring I am continually pulling up in my perennial beds where it once grew. Live and learn! To make mosquito repelling herb bundles you can burn, please visit this HGTV site. Consider herbs as ground cover. 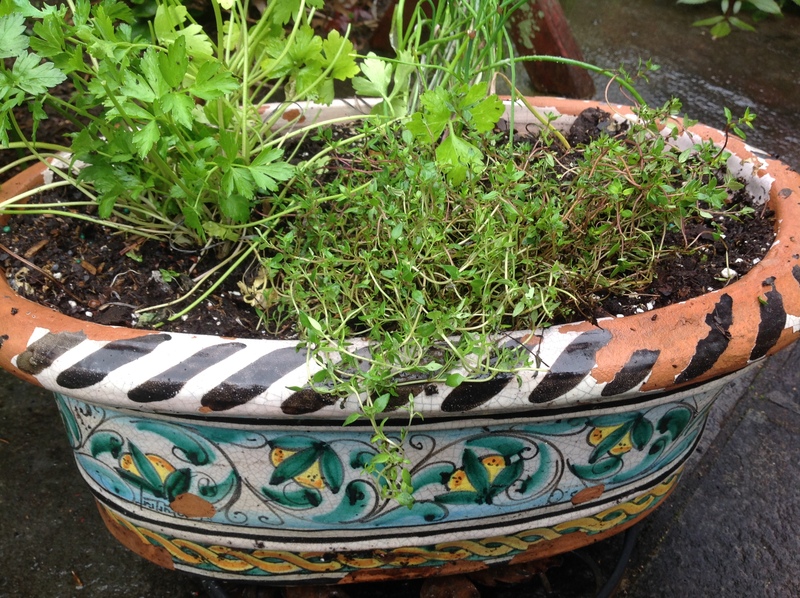 This is oregano but you could plant huge swaths of lemon thyme in the same fashion. 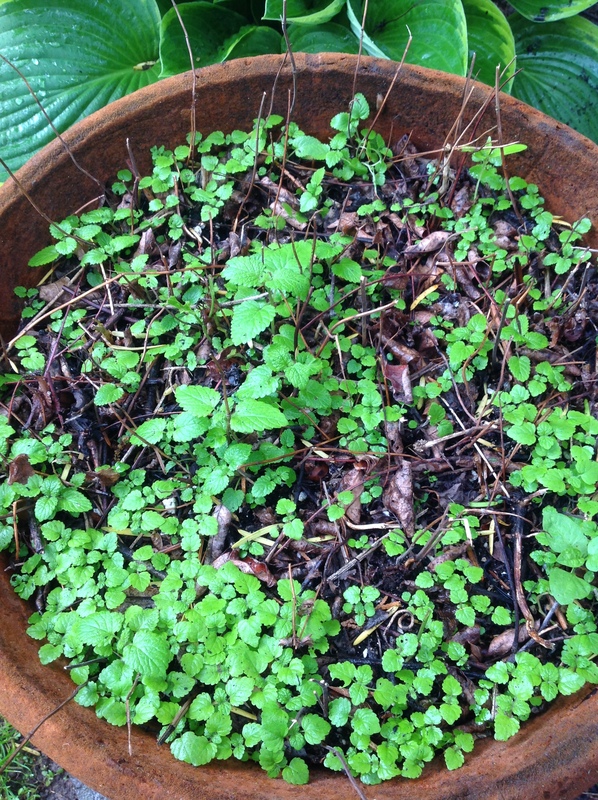 The only ground cover that survives basketball playing: mint. 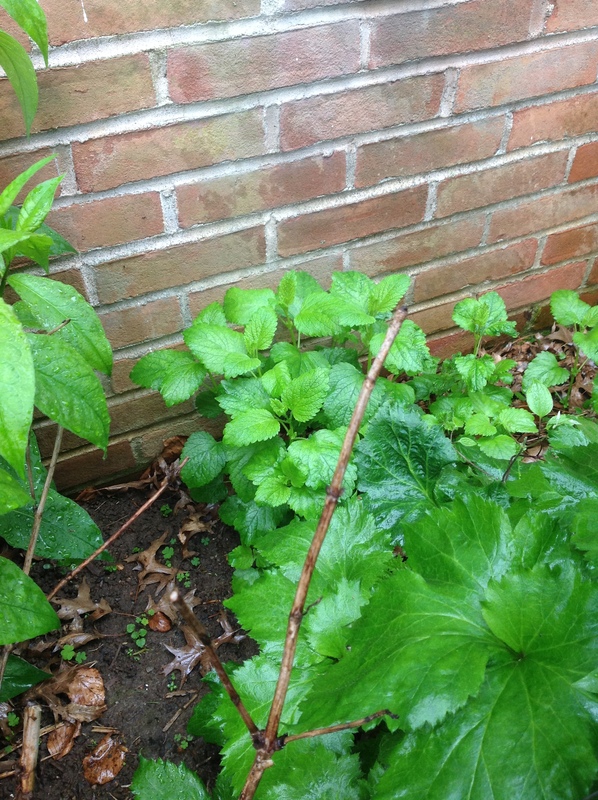 Although it is invasive, its spread is contained in this bed near the garage door and outdoor playing area for our kids. 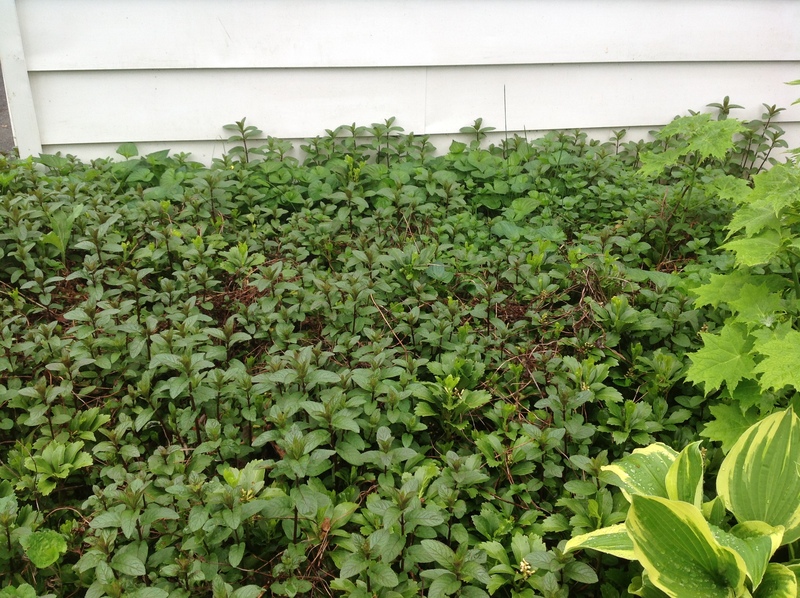 All types of mint are mosquito deterrent but highly invasive. 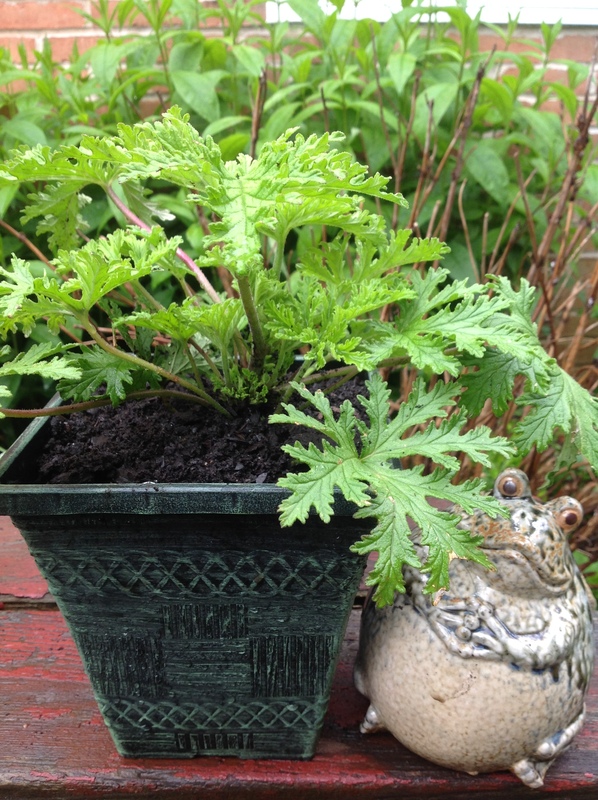 Citronella plant: It smells just like the candles and oil. Home Depot sold them also in big hanging baskets practical to hang around an outdoor seating area. Catmint is a perennial that drives cats crazy but repels mosquitos. It will naturalize and spread into big flowering clumps in the garden and flower all summer with pretty purple blooms. If it gets straggly in late summer, cut it back for a second flowering. Catnip or nepeta faasenii with its delicate purple blooms, flowers all summer long. Catnip is considered much more powerful at repelling mosquitos than the toxic DEET. Annuals such as lemon scented geraniums, marigolds, chrysantemums and ageratum are all deterrents to mosquitos as they do not like their scent. 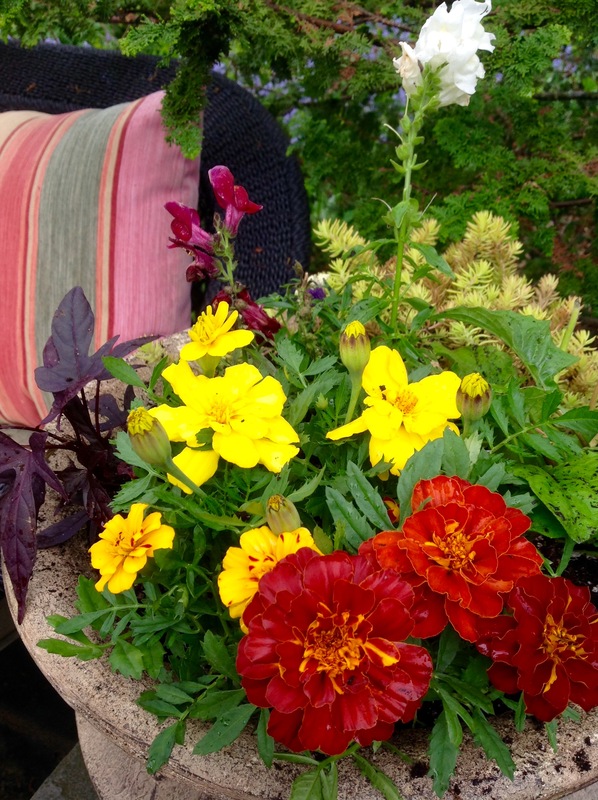 Although not a favorite, marigolds are an easy mosquito deterrent to plant as I did here in an outdoor seating area. 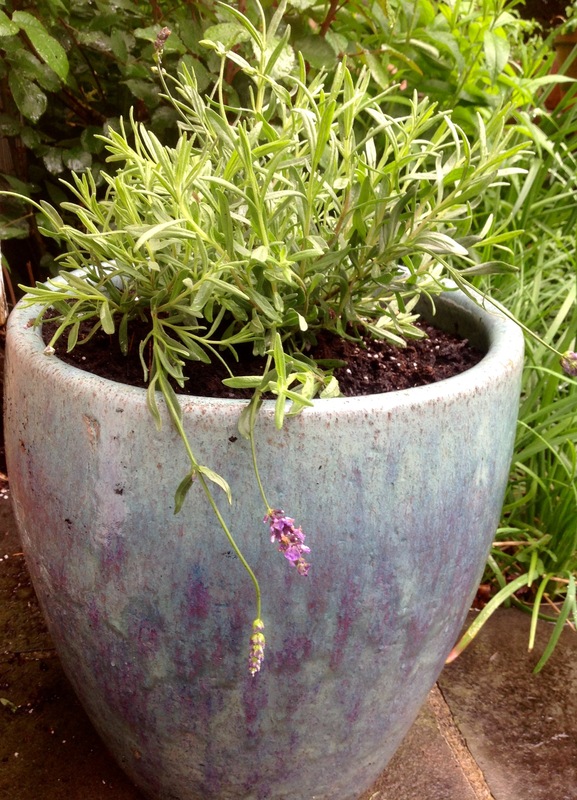 Lavender is another mosquito deterrent plant which can be planted in pots or in ground. Bee balm, penny royal and cat mint are all other good choices. Penny royal is harder to find but is also attributed to be a repellent of fleas and ticks. I grew up in Northern Ontario where mosquitos seemed to be the size of dinner plates and were always ravenous. In Pennsylvania where we now reside, we have very few mosquitos. While I was researching this post, I discovered that cedars in the thuja family are natural mosquito repellents(Horticulture Magazine). Arbovitae are in this class of trees. Our outdoor spaces are all surrounded by arbovitae as privacy screens. Who knows if they are responsible for so few mosquitos. 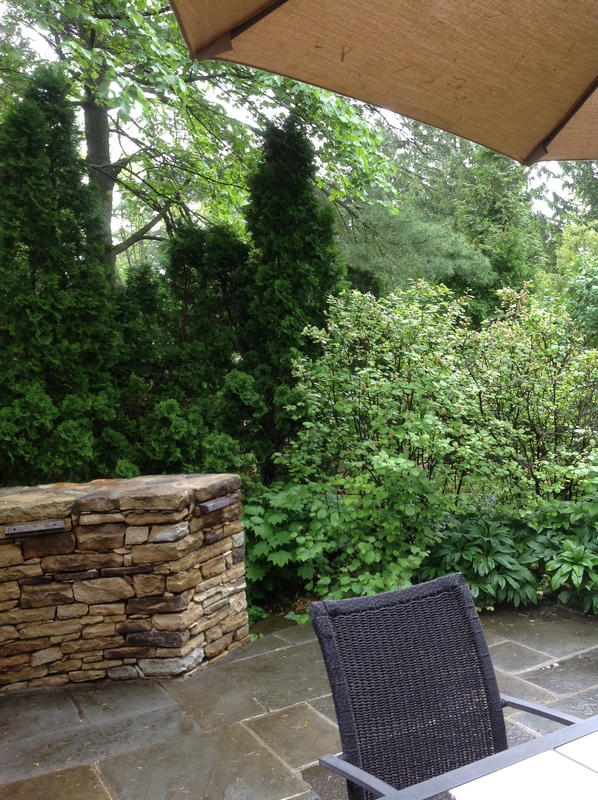 But if you are designing outdoor plantings, consider incorporating cedars near your seating areas. Arbovitae in the background. 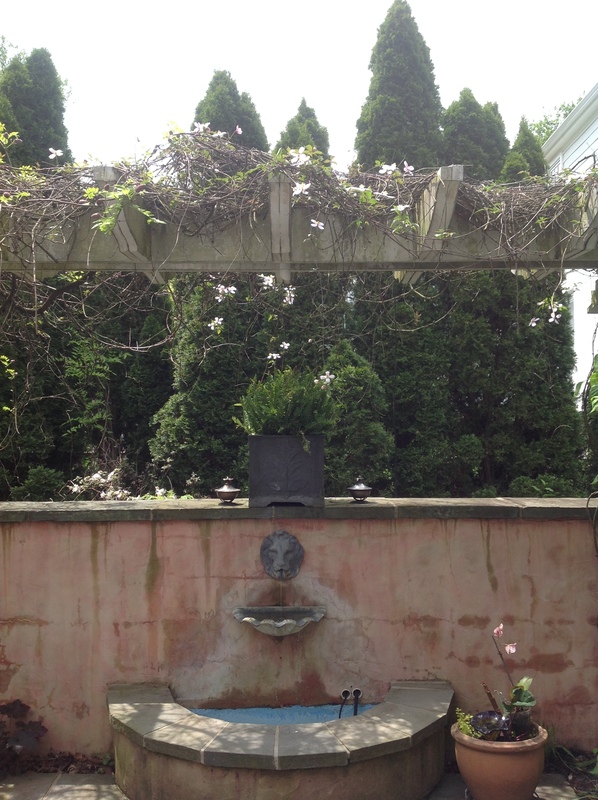 If you have garden fountains as we do, ensure the water circulates with a pump to prevent mosquito breeding grounds. I do add tiny amounts of pool chlorine to this inground pond. Frogs, dragonflies, bats and birds, especially purple martins, all consume large quantities of insects. Attract them to your outdoor spaces. Refraining from using chemicals in your garden makes it more creature friendly. Break out your fans and create a breeze! Mosquitos can’t fly through a breeze. 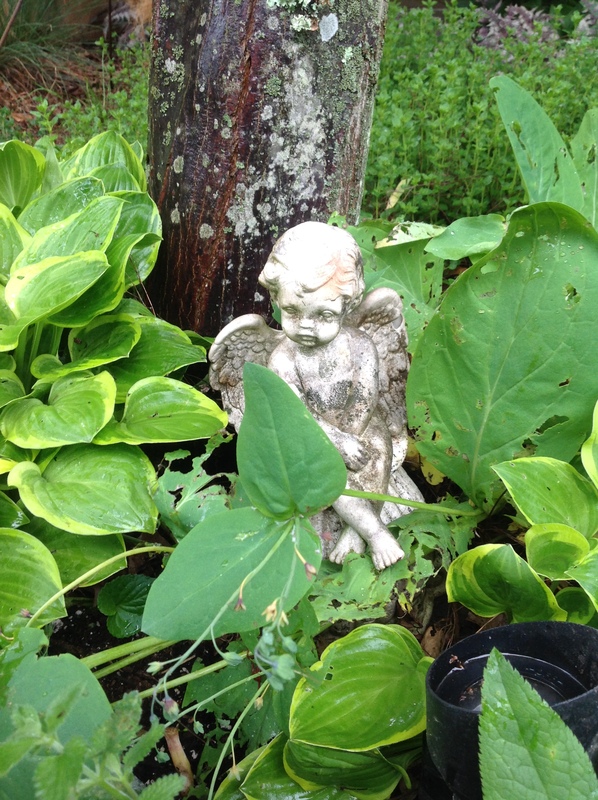 As I set out to research mosquito-proofing outdoor spaces, I was happy to discover our gardens spaces already had in place many plants, herbs and trees for deterring these pests. My local Home Depot and other nurseries had many of the plants I added in our natural defense efforts against mosquitos and all were readily available. One thing I am sure of, I won’t be deterred from having random conversations with random people. I learned so much from speaking with the young father-to-be at the Home Depot, determined to keep his unborn child safe from zika virus. Very inspiring and touching. This entry was posted in Gardening and tagged fight zika virus in your garden, flowers that repel mosquitos, gardening to prevent mosquitos, herbs that repel mosquitos, home depot, home depot nursery, how to fight zika in your outdoor spaces, plants to repel mosquitos, trees to repel mosquitos, zika virus by Johanne Lamarche. Bookmark the permalink. Thanks so much, Loretta. As I wrote this, I thought I should invite you over to develop the post together, but I just kept put-zing along between the rain! I thought it would be right up your alley. Sounds like we both embarrass our children! 😀 So glad you found some new information. I have not had any luck with bee balm although I have plenty of sun. Just doesn’t return. Johanne, this information could not have come at a better time! I got my first mosquito bite last weekend! We are ever vigilant in our yard doing all the things you discussed except for some of the plantings so thanks for that additional information. Nashville is like one big swamp in the summer and the mosquito season starts early here as you may know so I am going to tell friends and neighbors about your post in hopes that they will take a look and learn. Big thanks to you for being so friendly to strangers! You never know where a blog inspiration will come from do you? You were on my mind as I wrote this post Teresa. Why? Well I debated sharing the story about the young father-to-be who inspired the post or just get down to the business of the subject. But then I thought, Teresa often comments on my “Johanne” stories so….I opened with the story and am glad I did. I am sorry you have already been bitten by a mosquito so early this season. I think nurseries are consciously offering many of the mosquito deterrent plants as I found several, like the citronella one, labelled as such. I hope you can find some additional ones to add and protect you! 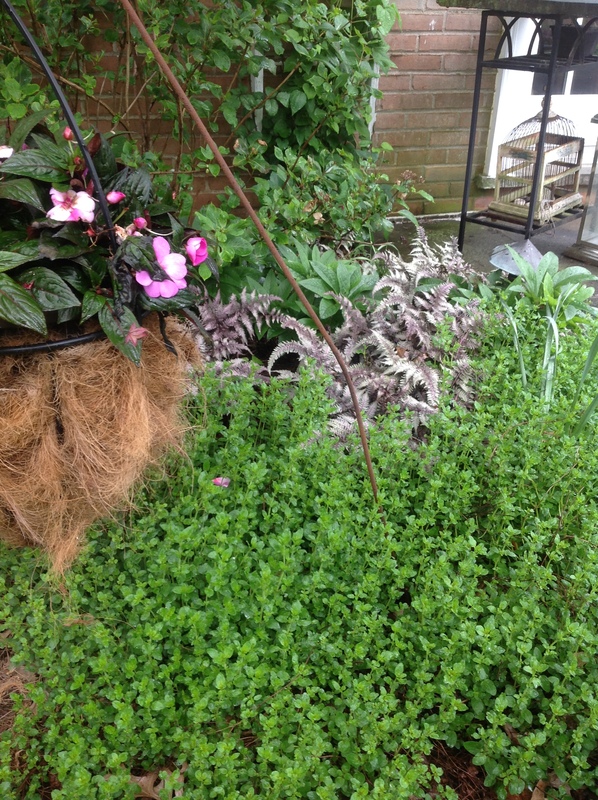 Lovely post and I enjoyed seeing all the different herbs and vases in your garden! 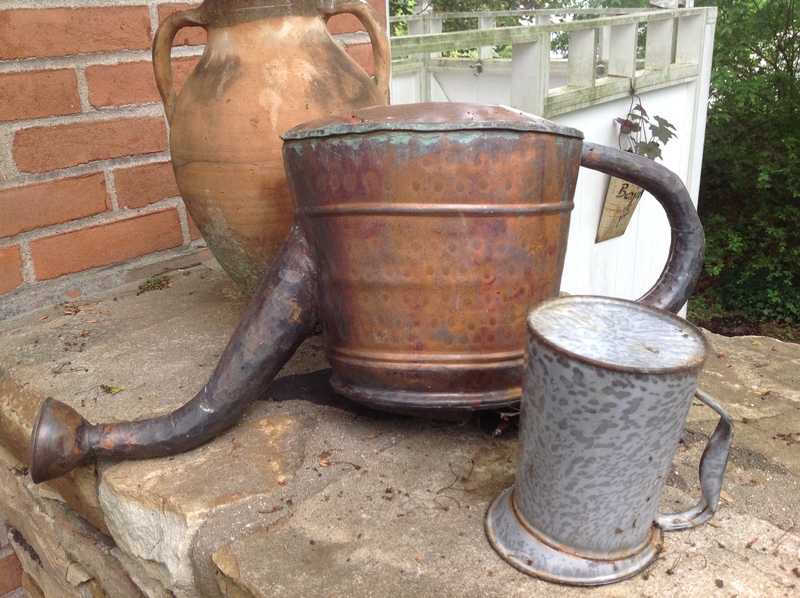 Antique oil vessels!! *jealous* lol! I speak with random people all the time to the embarrassment of my children – and have learned so much over the years, too. I love these ideas and had no idea Home Depot sold citronella plants, so I guess you’re my random person, today, Johanne! I always have a lot of herbs, and one of my gardens is designed specifically to attract birds, butterflies and bees, so I’m going to start working some of your ideas into it. 🙂 I cannot imagine how overgrown it is!! I have a bit of an ache in my heart! What an informative and colorful article this was, Johanne. I have been more conscious about the standing water in the bird baths this spring because, I too am concerned about those pesky mosquitos. There is nothing worse than trying to enjoy your garden and you get bitten all over your body! That was information that we all could use. Thank you! Glad you liked this post Eileen. I too am more diligent with standing water especially. Enjoyed all your trip photos! Looks like you had an amazing time! This post did give a mini tour of my gardens! Are mosquitos prevalent in the UK? Have there been any cases of zika documented? Happy Sunday Ginger! I am in good company then Josette! LOL. Hope some of these mosquito proofing suggestions help keep your family safe this summer. I love your very elegant and beautiful garden Johanne. I also enjoyed reading your post very much. I knew about the aromatic herbs for the garden, but your post offered more extensive and new information.. I have been using mint, oregano, lavender and rosemary through out the garden. So I am hoping that it helps this year. Your pots are also very pretty. They have a rustic feel to them. Very Tuscan look to your yard. Thank you for sharing such valuable information and inspiration. I don’t know if my comments are coming through. I had to create another account for wordpress. Hi Janet! Yes your comments are coming through. I had the same problem with blogspot so I hope you are receiving mine. I am glad you found some additional information on mosquito proofing our outdoor spaces. It sounds like you are off to a good start with the herbs! My garden is walled in some sections with Tuscan like coloration to the walls, as you were astute in observing. The plantings are more English wild gardens…anything grows to abandon, including weeds! If we ever get together for tea I’ll have you over for a tour. I am sure I would like your husband! Lucky you to be heading to the shore soon Jenna. Enjoy!! Wonderful post — Thank you for this also! You are welcomed Tammi! I had fun researching this post and adding so many discoveries to my garden. I keep learning more on mosquito proofing as we all fear Zika and so many articles are getting written recently. I hope your summer is mosquito proof!